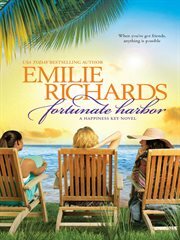 The item Fortunate harbor, Emilie Richards represents a specific, individual, material embodiment of a distinct intellectual or artistic creation found in Evansville Vanderburgh Public Library. Join five women connected only by their growing friendship and the road that runs like a lifeline between their cottages in a run-down Florida development called Happiness KeyTracy Deloche finally gets a chance to swap business for a romantic evening with Marsh Egan, but dinner goes cold when she spots her ex-husband prowling outside her cottage. CJ is supposed to be in prison and out of her life for good. Exactly what is this modern-day pirate seeking and what will it mean for Tracy's future? Janya Kapur envies every pregnant woman she sees, but Rishi, her husband, is suddenly reluctant to talk about children. Is he disappointed in her inability to conceive? Their marriage was a contract between strangers. Can they ever hope for anything more? Waitress Wanda Gray loses her job after new owners turn the Dancing Shrimp into a tapas bar. Wise neighbor Alice Brooks's suggestion that Wanda start her own business seems like a brilliant solution, until Wanda starts Pie War I with the owners of the local bakery. When the empty cottage at Happiness Key is rented by single mother Dana Turner, everything seems perfect. With Alice volunteering to watch Dana's daughter while she works and Wanda's offer of a job, this spit of Florida Gulf Coast land should be a fortunate harbor for a mother and daughter who have moved far too often. Except for Dana's shocking secret. As the women of Happiness Key struggle to discover the truth in time to help their new neighbor, their only weapon is friendship. But will friendship be enough?